One of the first tasks UCLA freshman Suzannah Henderson was assigned in the course “Frontiers in Human Aging” called for her to reflect on ageism in America and the negative stereotypes about older adults that are everywhere, from the grumpy old man portrayed on TV to the obnoxious birthday cards that poke fun at dotty old folks. “Frontiers in Human Aging” is one of 10 cluster courses offered to freshmen that are interdisciplinary, explore major issues of timely importance and taught by teams of three or four distinguished faculty members. 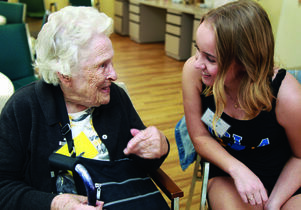 Each year approximately 120 UCLA freshmen journey through “Frontiers in Human Aging,” learning about growing old from multiple vantage points —– biology, psychology, sociology, ethics, policy and public health — through lessons delivered by a wide-ranging group of faculty experts and from older adults themselves, via hands-on community service experiences. While many instructors are brought in as guest lecturers to cover the vast scope of disciplinary approaches to the study of aging, the course's three core UCLA faculty members have connections to the Fielding School of Public Health, the Luskin School of Public Affairs and the David Geffen School of Medicine: Paul Hsu, adjunct assistant professor in epidemiology; Lené Levy-Storms, an associate professor of social welfare and geriatrics; and Rita Effros, professor of pathology and laboratory medicine who specializes in immunology. Students also learn about aging at the cellular level, including what is known and being investigated about the biological aging processes and the potential to manipulate them for better health. Issues are raised about how gender, race, ethnicity and social environment interact with aging. Ethical questions, economic concerns and intergenerational dynamics are explored. Students delve into aging-relevant policy — from Medicare to the implications of the Affordable Care Act for older adults. Psychological and social elements of aging are discussed, as are the differences among chronological, social and functional age. They find out about successful approaches to remaining mentally, socially and physically engaged later in life. 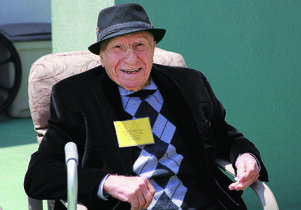 Students also spend meaningful time interacting with older adults in the winter quarter through a five-week, service-learning experience in which they are placed in agencies that serve elders, such as senior centers, assisted-living facilities and adult day care centers. The students keep journals where they reflect on their experiences and link them with classroom and book concepts. This story is adapted from one in the spring/summer 2016 issue of UCLA Public Health Magazine.